I have spent months retreating into books while I've been ill, and thinking about writing them, then picking up the next book, and the next, and the posts I've thought about have slid away until reading each book was too far distant to write about them as I wanted to... So, now I'm working back through the stack and reading them again - this is the first of what I hope will be more regular posts as I push myself back into the habit of writing. Still Alice is one of those books that made a huge impression on me that stayed long after the first reading - long enough for my memory to have enabled me to post, but there were layers of processing that stopped me at that point. It tells the story of Dr Alice Howland, respected linguistics expert, revered Harvard teacher, loved wife and colleague of Dr John Howland - also a Harvard professor, mother of Anna, Tom and Lydia. We first meet her, approaching her 50th birthday, in her home in Boston, prepping for an interstate lecture, while John - always disorganised - is fussing around the house trying to find his glasses before he leaves to get back to his lab. She puts her notes aside, calmly does a quick search while John continues fussing, and locates the missing glasses. John leaves, Alice repacks her bag, which is still partially packed from her last trip, and heads to the west coast. Alice and John's lives have centred around their academic pursuits, Alice fitting hers around the children while they were small, eventually catching up and achieving her doctorate, then tenure. During a sabbatical they took together, the pair collaborated on a book that brings their two disciplines together - John's biochemistry and her linguistics. Their eldest, Anna, is a successful lawyer, married to Charles, also a lawyer. Tom, the middle child, is in medical school. Lydia, the youngest, has broken the family's academic tradition and is in LA taking acting classes, hoping to make it as an actor. Back at home, Alice and John are in conflict over this - Alice feeling Lydia should go to college so she always has back up, John supporting Lydia emotionally and financially, saying she's made her choice and should be supported as were the other two. Alice's upcoming trip to the west coast for her lecture is also an opportunity to catch up with Lydia - which she anticipates with mixed feelings, as the two rarely manage to get together without arguing about the college/acting issue. At the lecture, Alice has - for her - the never before experience of freezing, blank, on the podium. It's only a couple of seconds, but she is seriously rattled to find herself unable to find the word she wants at that point. She covers, and finishes the lecture, hoping her slip wasn't obvious. She is partly reassured by the reaction of her academic hosts, but it's a worrying niggle that she adds to other, equally, inexplicable wrinkles in her busy life. Dinner later with Lydia is as mixed as Alice anticipates, and heading back to Boston, she is tired and flat. She arrives home to an empty house, having hoped that John would be home from the lab to greet her, something that's happening less and less as he focuses more and more on his work. Feeling frustrated and let down, she decides to go for a run, hoping that the exercise, which she missed during her trip, will lift her mood. Her regular run is a circuit that normally takes about 45 minutes, and all goes well until the very end, when she slows to a walk for to cool down over the last stretch and, reaching an intersection, she is suddenly completely unable to remember which way to go to get home. She knows she's in Boston, she's on a footpath near Harvard, under a mile from home, and she hasn't the faintest idea whether to go straight ahead, left or right. Fighting increasing panic and disorientation, she searches the nearby landmarks for clues, and as abruptly as the memory blank descended, her mind is clear again, and she makes it home, finding John on the point of leaving - having come home from the lab to find her not there... The stress of the ensuing mild altercation pushes what happened from the front of Alice's thoughts until John has gone, when it comes back and she finds herself going over and over the episode before she eventually decides she's just tired, stressed, maybe getting menopausal...time to schedule a checkup with her doctor. At the doctor's, her GP (PCP for my American readers) quizzes her about what's been going on, and after answering the doctor's questions, Alice puts forward her own theory - that it's menopause causing the memory lapses, having done some research prior to the appointment. The doctor agrees that one of the symptoms of menopause CAN be memory dysfunction, but it's usually associated with poor sleep hygiene, and Alice's sleep is just fine... The doctor suggests they monitor the situation for a while, and orders blood tests and an MRI. Glitches keep happening... A mysterious note, 'Eric', on one of her many post-its makes no sense at all, until the day she gets a reminder from a colleague about some microscope slide images she'd promised to send for a presentation that haven't been sent. She preps in her office for one of her teaching lectures, and then, when she arrives at the hall, can no longer remember which topic - the topic she's just reviewed half an hour previously. Back at the doctor for results, she is told that her blood work is clear, as is the MRI. The doctor begins to suggest waiting a couple of months and monitoring, but Alice doesn't want that, and asks to see a neurologist. At a staff holiday party in December, Alice is introduced to her graduate student's new wife early in the evening. In the ebb and flow of party socialising, Alice finds herself next to a young woman she doesn't remember and introduces herself. The circle of people, which includes John, registers surprise - it is Dan's new wife who she's just met... John decides that it's time to wrap up, says their goodbyes, and they head home. Three days before Christmas, she's meeting with the neurologist for the first time. He works her through a rigorous test of her memory, quizzing her on facts from her life and random puzzles. At the end of the appointment, he tells her he wants to do some further testing...she locks him into a stare, tacitly challenging him to divulge what he's thinking, which he doesn't, but in that instant, she realises he knows what it is, but isn't prepared to tell her until he finishes investigating. Home again, she throws herself into Christmas preparations - the whole family will be together again and various traditions will be observed, including making her mother's chocolate bread and butter pudding on Christmas Eve - a dish she's made every year as long as anyone can remember. Only, this year, she can't remember the recipe - it's not written down, and her mother died in a car accident when she was still in college... She tries every way she can think of to recall how many eggs she needs, and in frustration, smashes all the eggs into the sink. She also devises variations on the neurologists quizzes, relentlessly testing herself, trying to convince herself nothing's wrong. But something is wrong. Badly wrong. At her next appointment, after reminding her that she must always have someone with her for appointments, the doctor tells her she has early onset Alzheimers Disease. Telling John proves to be just as difficult as she imagined. He's determined that she's been misdiagnosed and insists on genetic testing to look for one of three possible gene mutations that can be present in an Alzheimers patient...but not always, which is when it hits her - if she has the gene, all three children have a 50% chance of having it too, which means they could also be in line to have the same diagnosis. The test is positive. There is no putting off telling the children - particularly Anna, who has been trying to conceive for some time. John flies Lydia home and when they're all together, Alice breaks the news herself. Anna and Tom decide they want to be tested. Lydia decides she doesn't want to know. Tom is negative. Anna is not. She will also develop Alzheimers. The book spans a time period between September 2003 and September 2005. 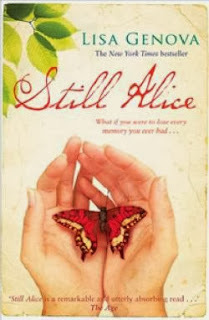 It details Alice's deterioration and the shifting dynamic of the family as each, Alice included, try in their own ways, to cope with what is happening. Anna and Charlie elect to go ahead with having their children, but go via IVF and embryo testing to ensure that their children don't carry the gene. John pushes hard for Alice to try a number of trial procedures and drugs but, exerting her independence with the support of her neurologist, she chooses to join a clinical trial that is in its third stage, a drug that is hoped to arrest the progress of the disease. Alice's deterioration appears to bring a new dimension in the relationship between her and Lydia - Lydia becomes one of Alice's strongest advocates and supports. Tom is a somewhat peripheral figure. He's there, present at nearly every mass family gathering, but apart from the critical moment of disclosure to Alice after he and Anna are tested for the mutant gene, and a later conflict that brings everyone against John, he's not a very strong figure. And John... John, from the outset, is prickly, righteous, intensely work-focused and he struggles to deal with Alice's diagnosis and prognosis from the outset. He becomes, by default, her primary carer, but without compromising his work time - leaving notes like the big one on the fridge that reminds Alice NOT to run without him (once it becomes clear that she probably can't get herself home again alone) to cover the fact that Alice is left on her own at home for increasing periods. He is, of course, grieving the loss of Alice as he knew her, but seems incapable of acknowledging that, and is presented as someone who is often impatient, cross and frustrated. At times of crisis - like the time that a series of blanks lead to Alice wetting herself because at first she can't remember she is trying to go to the bathroom before they run, to the point that she can't find the bathroom when she's at bursting point and John comes looking for her just as she voids - he is able to be everything she needs, the warm, loving, comforting partner who makes her feel safe. However, on a day to day basis, it's the prickles that show most. Living with a degenerative disease is a truly disabling experience, at every possible level. The losses are hard for anyone to understand if they've not experienced it for themselves. This is what makes it so very difficult for those who care for loved ones who have illnesses like Alzheimers, and this is one outstanding feature of this novel - the sensitivity and level of understanding of those struggles - Alice's, as she feels herself losing more and more of her capabilities, and worse, when she is still functioning well enough to be aware of losing her sense of what it is that makes her HER, and the rest of the family. Genova doesn't create a heroic and noble family who support Alice through the course of her disease without complaint. The Howland family are a very normal, ordinarily dysfunctional family. There is great love in this family, but there are also deep-seated aggravations, disagreements and resentments that flower at times under the increasingly difficult challenges they face. This is a beautifully crafted book dealing with a topic that most of us prefer not to acknowledge unless we are not given the choice. It's not all doom and gloom, but it's not mawkish or sentimental either. There are moments of humour, whimsy, and reality that most readers will find quite familiar - the normal stuff of families. Alice's inner journey offers a wonderful insight into the experience of having Alzheimers or dementia, and I would encourage people to seek out this book for its sense of truth.